Selecting the best garage doors for your particular situation requires a lot of thought and research. You have several different materials to choose from. There are different types of insulation to consider. Some doors are relatively low-maintenance, while others require refinishing every few years. Not to mention the thousands of different styles and colors that are available. How do you choose the best set of doors for your particular needs? The first step is to choose what material you want the door to be made from. But to make the right decision, you need to know the pros and cons of each type of material. Garage doors can be found in steel, wood, aluminum, fiberglass, vinyl, glass, and even copper or stainless steel. Each of these materials has its own advantages and disadvantages. Your decision will be influenced by the style of your home, the region that you live in, and the weather that you have. There is no such thing as one "best garage door" for all situations. The most popular type sold today is the steel garage door. Steel is strong, lightweight, relatively maintenance free, and less expensive than comparable designs made from other materials. There is a larger variety of steel doors available than in any other material. 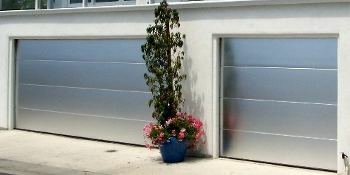 Steel doors are often the best garage doors for most "normal" applications. However, they can be dented from an impact, and will rust if the finish is damaged. Wooden garage doors are the second most popular type. Wood requires more maintenance than any other type of door, but for some applications nothing else will really look right. You just can't quite duplicate the look of real stained wood using any other material. There is a wide variety of styles and options available in wood, also. Of course, wood is heavy and is prone to moisture and insect damage if not maintained properly. Fiberglass garage doors are also rust proof and require very little maintenance. They don't usually dent, but they can become brittle with age and in extremely cold weather. It is possible for them to break from a sharp impact. Single layer fiberglass designs will let some light in, but are also rather flimsy and easier to break in to. There aren't as many fiberglass models available as there are in other materials. Vinyl garage doors have similar advantages and disadvantages as fiberglass. They are rust proof, require little maintenance, and are more dent-resistant than any other door material. They also can become brittle with age and extreme cold weather, however, and the color choices are mostly limited to lighter colors (dark colored vinyl has longevity issues). These are the best garage doors when it comes to overall longevity in most cases. 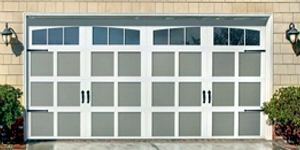 Glass garage doors are made with a steel, aluminum, or wooden frame, and many different glass options are available. They are not nearly as fragile as you might think! They are very heavy though, and expensive compared to other types. Glass is often the best garage door design for a contemporary or modern style home. Copper doors are an interesting and expensive option that is usually found only on upscale homes. Copper will tarnish and eventually turn green with age (unless they are clear coated), but this "patina" is what makes them attractive to some people. Stainless steel doors are another unique and expensive option. For more information on both of these, visit the metal garage doors page. Some doors use a combination of materials for the different layers. A door may have a wood-composite exterior shell on top of a steel panel, or a steel outer layer and a vinyl inner layer. There are lots of different combinations available from various manufacturers. That just about covers the available materials. Once you have decided on a material, next you have to decide what style you want. Most styles can be found in any of the above materials, the exception being glass doors, which are a style of their own. The most popular style today is the carriage house design. Real carriage house doors are made of wood, and either swing, slide, or fold open. If you want the look without the maintenance headaches of wood, but with the convenience of a sectional overhead door, you can find carriage style doors in any material (except for glass, of course!). Other styles include raised panel, recessed panel, flush panel, and ribbed rollup doors. An interesting alternative to the conventional overhead design is the bifold door. Bifold garage doors can either fold sideways or vertically. The vertical type folds outward and upward, and creates a bit of extra shelter underneath when it is open. There are two popular types of insulation for garage doors, polystyrene and polyurethane. Polystyrene foam insulation is usually a rigid panel that is placed inside the door sections during the manufacturing process. It is typically less expensive than polyurethane, but is also less efficient. Polyurethane insulation is usually foamed into place inside each door section, and will bond to the interior and exterior panels. This adds rigidity to the door, and also is better at reducing noise transmission than polystyrene. Polyurethane foam has roughly twice the R-value of equal-thickness polystyrene. As you can see, there are a lot of options to choose from. Each type has pros and cons. You just have to weigh each one of them against your needs, and choose the best garage doors for your particular situation. 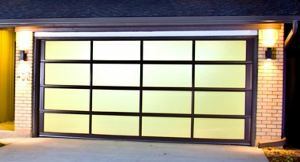 Check out the menu of our Related Pages for information on all the different garage door types.